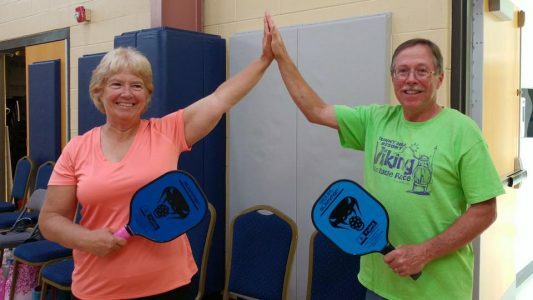 You may have heard about Pickleball, or have seen it played at your local Y, but what is it? Well, it’s sort of like tennis, but on a smaller scale. It’s been a hit with the older community as it’s a fun, fast-paced, yet low-impact workout! But why should you get started? Playing Pickleball, like other forms of exercise, can lower blood pressure, reduce stress, increase flexibility, and lead to a better, healthier you. But unlike walking on the treadmill or using other machines in the wellness center, this is a socially oriented game that keeps you engaged from beginning to end! People of all levels play because it’s easy to learn. It’s sort of like tennis, squash, and racquetball mixed into one! If you know the rules to those games, you’ll pick up Pickleball pretty quickly. While we are set up at the Y for Pickleball, it’s fairly easy to break down and take with you. You can take it on vacation or to a friend’s house! You can fit 2-3 Pickleball games onto a single tennis court. So you don’t have to worry about running all over the place! Participating in competitive sports is good for the soul. It encourages you to push a little harder and work a little more each time! Unlike tennis, you don’t have to be the youngest or strongest person on the court. Pickleball is more about patience and strategy than it is about strength. While the sport is more popular within the senior community, it’s a great game for people of all ages! Why not try playing with the whole family? Not only do you get to socialize on the court, but friendships extend beyond the court! Our group of Pickleballers at our Southern Saratoga location have monthly mixers at local restaurants! 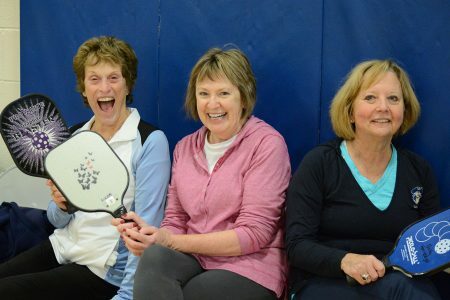 Want to try Pickleball? Stop in anytime!